We are working on a program for you, our community partners, to provide a special holiday shopping evening at Heights Arts! It’s a win-win proposition! We will extend our discount for store purchases to your members, clients, or shoppers in exchange for your support in promoting the event and helping us with the food cost. We think this is a great opportunity for us to provide your special people with a perk while in return, they are supporting local artists and their work. 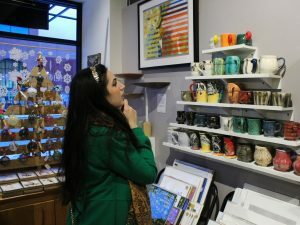 This year, we will have more than 5000 items made by over 100 local artists – something for everyone to enjoy as they look for that special gift for a loved one or family member. But wait, there’s more! We will have a local artist present that evening to give a short talk about their work – as you know, the story behind the art makes it even more special. So, please help us share the creativity that is your community by participating in our Community Partner Appreciation night. Extend Heights Arts’ 10% membership discount to partner attendees. Attendees who are already Heights Arts members will receive an additional 5% discount for purchases for that evening. Monday Dec. 3 2018, 6–8 p.m.
Monday Dec. 10 2018, 6–8 p.m.
Monday Dec. 17 2018, 6–8 p.m. Available Dates: All events will take place between 6:00 and 8:00. * Heights Arts reserves the right to include more than one organization on the same evening, pending response and popularity of date requests. If you prefer your own private event, we may be able to accommodate you – please indicate this on your confirmation. Mondays are open to the public. Want a private shopping event for your organization? We can accommodate up to 50 people on a Tuesday, Wednesday or Thursday evening between 6:30 and 9:30. Please contact us for more information. Questions? email us at: programs@heightsarts.org or call 216-371-3457 ext 103.